Beautiful portraits are enjoyed for generations, and are a wonderful investment for any family. 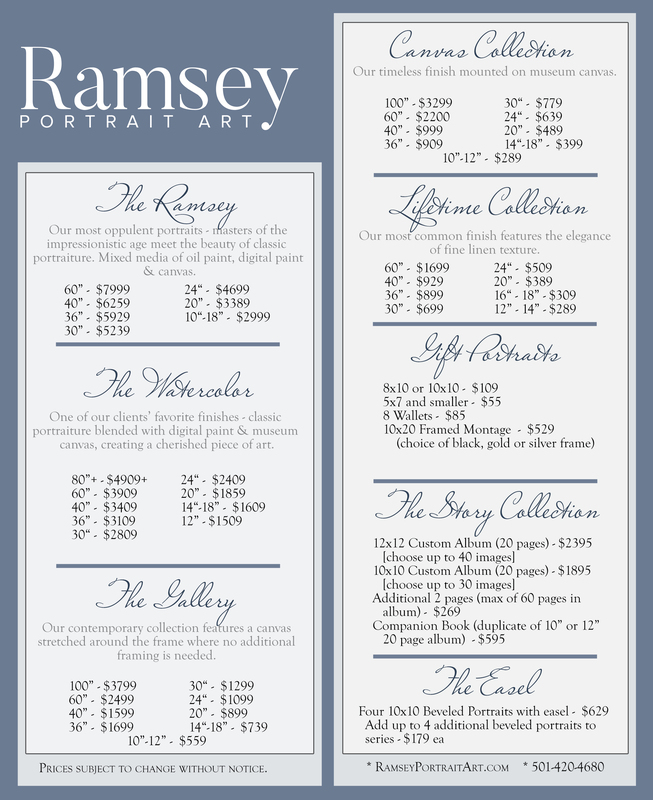 At Ramsey Portrait Art, making that investment is simple. Our standard Reservation Fee for individuals, families and groups of less than eight is $500. This reservation fee is due at the time of your booking, $75 is your location fee and the remaining $425 is applied towards your order. Our Beach Session Reservation fee for individuals, families and groups of less than eight is $750, $150 location fee and the remaining $600 is applied to your order. Larger groups can easily be accommodated, but please call in advance for a quote. Also, please note that some special locations require an additional fee for access to the grounds as well as a location fee. We select these locations carefully, and the gorgeous scenery is well worth the small extra expense! Feel free to contact us at any time for additional information. Please remember we reserve time especially for you. If you must cancel your session, please contact us at least 24 hours in advance. We deduct $100 from your reservation fee for canceling the day of your session. If you simply don’t show up, you will forfeit your entire reservation fee. Beach Session Cancellations — We do not refund Beach Reservations. We schedule 2 appointments per day, one during sunrise and one at sunset. Because these appointments are so limited, we cannot offer any refund for canceling your appointment. Quick Pic Session Cancellations — We do not refund Quick Pic Reservations. Because these events are seasonal in nature, we will allow you to reschedule your appointment time once. If you are unable to reschedule and have made attempts to do so, we will allow your reservation to be used as a credit towards a future appointment at our studio. If you cancel the session within 24 hours of your appointment, there is no refund as we will likely be unable to fill your time. Full payment is expected the day of your ordering session. We do offer payment options for orders of $2000 or more. However, no orders will be placed until full payment is received. Approximately 10-12 weeks after your order is placed, we will contact you for delivery of your portraits. Please note that some products take extra time for the creation process. Local orders that do not include a wall portrait will be mailed via USPS. Wall portraits and all out-of-state clients will receive their portraits via UPS. Simple, plain outfits always photograph best. In general, darker colors and long sleeves are preferred. The attention should be on your face, and long sleeves help eliminate distractions created by bare arms. The clothes should say something about who you are, but without being dominant. For most portraits, solid colors have a more timeless quality. Also, denim is almost always a great choice. Other good colors would be navy, greens, browns, reds, black and darker blues. Avoid pastels, pinks, yellows and other pale colors for color portraits, unless you are at the beach. Solid colors within the same color family are most appropriate. Work for balance, harmony and color coordination. Try placing your clothing side by side and see if any particular article “jumps out” at you. If it does, it will dominate all the more in your portrait and take away from the overall beauty. Keep your makeup natural and fresh. Eye shadow should be applied lightly and with care, since the center point of interest in a fine portrait is the eyes. Also, bring your makeup with you in case touch-ups are required. Avoid tan lines and sunburns. What are the guidelines for facial hair? A man with a beard or mustache should just make sure it is neatly trimmed. How do we keep the kids in line? It isn’t necessary to “train” your children to smile for the camera. We always have fun with children, and much prefer the easy, sunny smiles that come naturally! Do try to limit outfit changes, though. Changing clothes can become very frustrating for little ones (and for you, too). Can I use special items from home? Certainly! Personalize your child’s portraits with significant mementos like a favorite blanket, toy, rattle, family heirloom or favorite book. Teens can also showcase items that represent this time of transition and accomplishment with trophies, uniforms, instruments, artwork or other special mementos.